During the 12th Bangkok Chess Club Open I met up with last year’s champion GM Jan Gustafsson from Germany to talk about chess, his hometown Hamburg, the Bangkok Open, his impressions of Thailand, and much more. AK: Congratulations, Jan, your German team OSG Baden-Baden has just won the league title. How does that make you feel and what is the success strategy of your club? JG: Yes, I’ve read the news online. I can’t take much of the credit but it always feels good to win something. In general, having the strongest players is a good start if you want to win the league. Because of the generous sponsoring of Grenkeleasing [a German incorporation], Baden-Baden is in a situation in which we can afford having Anand and Carlson – even though he didn’t play well – and there are more strong players such as Bacrot, Naiditsch, Svidler, Shirov, and others. So I can’t say it’s a big surprise that we have won the title, but it’s still nice. Bremen put up a fight. It was a close match two rounds ago. AK: Based on your impressive score of 6.5 points out of 8 games in the German league, do you think your club will ask you to play more often, or is the competition within the team simply too high? JG: I was happy with the games I was getting. I don’t think it’s so much about the score because normally anyone on a low board is supposed to do well. It’s clear that in the one week against Bremen we tried to bring the strongest lineup, so I couldn’t make the team, but apart from that, I sat out one weekend and now I am playing here so I couldn’t be there. AK: You grew up in Germany in the northern city of Hamburg where you also developed into one of Germany’s strongest players. What is special about Hamburg and what does the chess club Hamburg SK mean to you? JG: I travel a lot but of all the places in Germany I really wouldn’t want to live anywhere else than in Hamburg. It’s my favorite city even though it rains a lot. Although the weather is not the main attraction, it’s a good place to live. It’s hard to describe what’s special about it. As with all big cities you basically can do anything you want. It’s got a relaxed atmosphere, that’s why I like it there. I was about eleven when we came back to Germany. I joined the Hamburg chess club and played for them for twenty years. Of course I still have close ties to them. It was a hard decision to leave to play for Baden-Baden, but basically all my growing up related to chess happened at the chess club in Hamburg. AK: Was it during your time in Hamburg that you decided to become a professional chess player? JG: I never really decided to become a professional. I guess the lines are very blurry there. I was a student, a lazy one, and I was doing reasonably well with chess and some other game [Gustafsson has co-authored a book on poker], so I hung around but it was never my career plan to become a professional chess player. I have a fulltime job. I work in an internet company and my work there is a bit related to chess because one of the tasks we are working on is to build a big chess platform which hopefully will be better than the other chess websites out there. AK: Now to the Bangkok Chess Club Open 2012: How do you evaluate your performance so far [5 points after 7 games] and how do you see your chances to defend your title? JG: My performance is terrible. I just can’t get my head to work. I’m not sure what the reasons are. You can always come up with a lot of excuses: jetlag, double-rounds, you name it, but in general I just haven’t been playing well and am upset about my performance. As for defending the title, there’s no chance whatsoever anymore. AK: What do you think about the level of competition? JG: I think the field is very similar to last year’s. There are four players above 2600 and a lot of other strong players. But I’m just disappointed with my own play. Of course I give my opponents credit for doing well, but it’s mainly all in my own head so it’s very hard for me to evaluate it adequately. AK: Besides you, two other top players here are GM Nigel Short and Women’s World Champion GM Hou Yifan. What have they brought to the world of chess that stands out? JG: They are both incredibly accomplished players. Nigel was vice world champion in 1993. I was 14 back then and following his match against Kasparov. I grew up watching his games. He has achieved so much in the chess world and he’s still going strong at his advanced age. 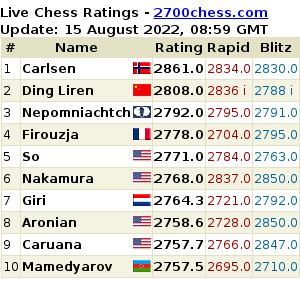 I believe at 46 he’s the oldest guy in the top 100, and now he’s back to a 2700 Elo rating, which is quite impressive. 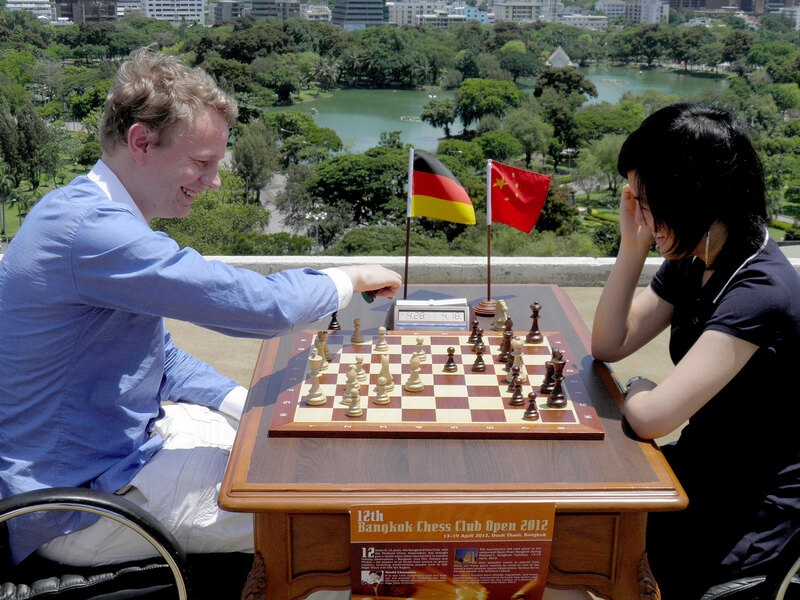 And there is not much one needs to say about Hou Yifan. I believe she has just turned 18 and is the Women’s World Champion. Apart from Judit Polgar she’s clearly the greatest female chess player in history. I don’t know her very well, but she seems to be very friendly and is a tremendous player. I’m a bit annoyed because for 10 to 15 years now I would have been the number two in the women’s world ranking but I’m afraid I’m losing that spot to her. AK: After last year’s open in Pattaya, this is the second time you are playing in Thailand. What are your impressions of these two tournaments, the venues, and organization? JG: I’ve been very happy to come back. The venues and organization have been top notch, both here in Bangkok and last year in Pattaya. Just look around the Dusit Thani Hotel. Chess players are not used to having this standard, the attention to detail like having a VIP dinner, and the support from Kai Tuorila [Tournament Director] and his team. They’re doing pretty much everything you could ask them for. It’s hard to compare the two cities though. I like Pattaya because it’s a smaller city and you can walk around, and obviously there’s quite a lot of nightlife just like in Bangkok. I enjoyed it there but the hotels are both excellent and Bangkok also has a lot to see. I just haven’t found the time yet to explore everything. It’s always a pleasure to come here. AK: Do you have any suggestions for changes concerning the tournament? JG: I’ve been asking them to get rid of the double-rounds. I don’t think anybody really likes to play double-rounds and especially for international players from Europe. They are jetlagged and start the games at 9 a.m. Thai time, which is 4 a.m. European time. That’s a bit tough. I would very much prefer to play one round per day. I understand there are considerations against it, such as the Thai holidays and the lower costs when there are only seven days. I spoke to a lot of people beforehand, telling them that this is a nice tournament, but when they hear about the double-rounds, they aren’t that eager to go. So, having one round per day is my suggestion. AK: I’ve noticed that your first action after every game is to step out to smoke a cigarette. How important is this ritual for you. What are some other rituals that help you to focus before a match and to unwind afterwards? JG: The smoking thing is not really a ritual; I’m just an addict. You are short of time in the final parts of the game. So I fix my nicotine need after the game. It’s nothing I’m overly proud of. I should quit because it’s obviously not a clever thing to do as a chess player. Other rituals keep changing. Most chess players are very superstitious, including me. Back in the days I had a lot of obsessions. I thought when I had black I had to wear black shoes and when I was white I had to wear white shoes. I gave up on that rule at some point because I was too lazy to follow it through. So I always have some superstitious nonsense in my mind, but there are no rituals. AK: What are your impressions of Bangkok and Thailand? Have you had a chance to go sightseeing in the city or travelling through the country? And what do you think about Thai people and Thai culture? JG: I haven’t seen all that much yet, I have to admit. I arrived two days before the first round and went to Pattaya with some friends. Here, I’ve mainly been playing chess, as sad as it sounds. I did go out at night and I had a look around at the usual nightlife hotspots, but I haven’t seen that much of the city to really appreciate it yet. It’s obviously a megacity and offers probably more than I can imagine. But because I don’t know my way around and I’m a lazy guy I haven’t seen as much as I would like to. I will try to catch up. I enjoy coming here because everybody seems to be very much at peace with themselves, which is different from Europe. The atmosphere seems relaxed here. I’m not sure whether this has to do with people’s Buddhist worldview. They seem to just seize the day and to be content with what they’ve got. They don’t seem to be as stressed out as we are in Europe where we drive ourselves crazy with our mental problems. AK: Is there a chance then that you will return next year for more chess in Thailand? JG: I’ll wait to see where the venue is and what will happen with the question about double-rounds. If I can make it happen – like I said I have a full time job so I have to select my tournaments carefully – I would very much like to be back. AK: Thank you. We hope to see you here again too.